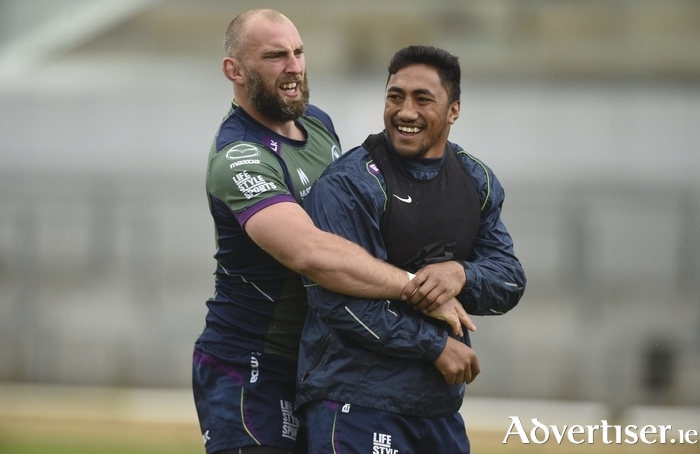 Connacht coach Pat Lam is preparing his players for the fight of their lives when they host Glasgow in the biggest game in the province's history on Saturday (6.30pm ). Lam says Connacht will need to channel all the hunger, excitement and energy which they possessed in bucketloads in their victory over Gregor Townsend's side two weeks ago if they are to advance to a first Guinness Pro 12 final. "We have gone to the well quite a few times this year," says Lam. "The Treviso game we identified straight away as one we didn't at all. It was probably the perfect lesson, because if we don't go to the well, then we are going to be an average team. That is the key for us, and everyone knows it." The current Pro 12 champions Glasgow will offer a lot more this time around, although they will be missing both Alex Dunbar through the knee injury he suffered in that 14-7 loss, and Sila Puafisi, the Glasgow tight head prop forward who has been suspended for three weeks for striking Kieran Marmion with the head. And there is some good news on the Connacht injury front with both Rodney Ah You and Finlay Bealham available, having completed their return-to-play protocols for respective head injuries, while Ronan Loughney has recovered from a shoulder injury. In the backs, Craig Ronaldson is available for the first time since recovering from the ankle injury sustained earlier in the season, but neither first-choice props, Denis Buckley nor Nathan White, will be available for the remainder of the season - Buckley having undergone ankle surgery this week, while Irish international White is "most likely" unavailable despite having resumed fitness training following concussion. Lam says although excited by the occasion, Connacht must remain focused. "This is different. You know this is normally shut-down time, so there is that excitement and you grab hold of it and use in the week's preparation. Certainly it has been building over the last five games when tickets were in demand, which shows there is demand for what we are doing and we appreciate it. "It's great to have the attention, but it has increased a lot for the players, the most we have ever had in our history. We have had a lot of big games, we have broken history, but the biggest thing is that we are focused on how to go about winning games, and that keeps everyone grounded, it gives understanding, and it gives everyone confidence that what we do during the week will make a difference at the weekend." And Lam says his players must embrace this occasion, but remain focused. "I'm not one to tell the boys to ignore everything, because it's the worst thing you can do, just acknowledge it, but know where it sits in the big scheme, and make sure that when they arrive they stand in the huddle in that dressing room and they look at each other, and their belief is not ra-ra belief, it is based on 'I know you well, I know what my job is, I know what we have to do to win, I trust you'. That is where the confidence and belief really comes from, and this is stuff we do every day." Connacht expect to come under pressure from a Glasgow outfit intent on reversing the trend only home semi-finalists have advanced to the final of this competition. "There is no doubt we will be under pressure, and that is where our relations and culture come into it. All the learning will come into this game." It is the same culture and relations that saw a group of Connacht players attempt to rescue a laptop allegedly stolen from Robbie Henshaw's car. "It is good to see the boys look out for each other on and off the field," says Lam. "It wasn't a smart thing to do and the boys know that. That is all I have to say about it."